John David, Washington and Adam Driver. Just when some people were beginning to think that filmmaker Spike Lee, known for his outspoken harsh and bold, assessment of race relations in his movies was fading from the forefront of black film directors, Lee (now 61 years of age), once again surprises his fans and audiences in general, with his latest highly relevant and powerful film “BlacKkKlansman” now in general release across the country. To begin with, the title sounds like an oxymoron. Very few words in America are more polar-opposite than ‘Black Klansman’. But director Lee, is not only a savvy and an accomplished and prolific filmmaker of some 26 films, 15 television shows, and 15 documentaries; he’s a master storyteller who loves to tell it like it is, warts and all. My favorites of Spike Lee impressive canon include: “She’s Gotta Have It” (1986; “Do the Right Thing” (1989; “Jungle Fever” (1991); “Malcom X” (1992). 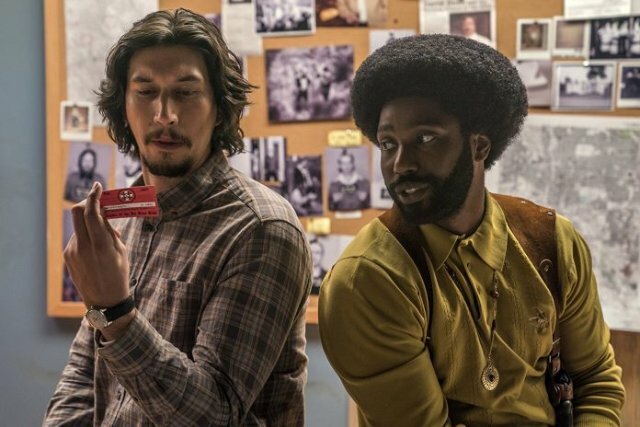 “BlacKkKlansman” is set in the high country of Colorado Springs in the 1970’s. John Stallworth (solidly played by John David Washington), is the first African-American police officer to break the color barrier in the city’s history. So naturally, one must revisit the echoes of the “Jackie Robinson syndrome” that affects newbies in all fields. For example, James Meredith, the first black student to attend the University of Mississippi, in 1962 also had to endure the wrath not only of the student body, but of the police, city officials, and the community as well. These incidents lend authenticity to the back story which Lee lays out in his plotline. Officer Stallworth’s first assignment begins in the Records Department, where he endures racial slurs and bullying from some of his fellow officers. The Chief (Robert John Burke), however, now needs him to go undercover for a speech to be delivered by former Black Panther Stokely Carmichael at a local college sponsored by the black student union. The Chief wants to know what and why Carmichael is speaking to the students and how his fiery and passionate speech will affect the campus and the community. These scenes directed by Lee are skillfully and powerfully performed by Corey Hawkins. This plot point, however, could be easily solved by having the local newspaper send a reporter to cover the event and the police could read about it the next day along with everyone else. But that’s not the way director Lee wants his story to unfold. Stallworth needs to meet Patrice (Laura Harrier), the president of the on-campus, black student union, who is unaware that Stallworth is a cop. She will play an important role later in the movie. But, no spoiler alerts here. Not all of the Chief’s officers are ’anti Stallworth’. Two dedicated-to-the-law detectives Adam Driver as Flip and Michael Buscemi as Jimmy are willing to cut Stallworth some slack in his rookie job performance. One day, Stallworth spots an ad in the local newspaper for the KKK and decides to call the listed number, and surprise! He talks his way into a meeting as a potential recruit for the local KKK boss who wants to meet him in person. Now this obviously presents a huge problem. Stallworth is black. I’ve often said when critiquing, if the viewers buy the original premise, then the viewers will buy the following ‘bits’; Ergo: Stallworth is black, but he has an idea for the Chief. He suggests sending detective Flip, although Jewish, is a more experienced officer to the meeting pretending to be Stallworth – a clever misrepresentation device used by Shakespeare in many of his comedy plays that other writers have also adopted, however, Mr. Lee’s movie is about a very serious subject matter: racial injustice and violence. There are a lot of moving parts to this sometime uneven, but always engrossing and provocative film. There is plenty of tension and suspense, with action sequences thrown in for good measure to keep the audience focused on the raison d’etre of the film’s message: “documented racism” that underpins Mr. Lee’s story. How these characters, including a wonderful performance by Topher Grace as the preening, slick-talking, KKK Grand Wizard, David Duke. Also, Adam Driver delivers a nicely understated performance as detective Flip , while psychopathic Felix (Jasper Paakkonen), goes a little over the top in his skeptical role of not believing that Flip is really a KKK candidate. The film is also blessed with an appearance by singer/actor/social activist Harry Belafonte who has an impressive on-camera cameo role as a narrator. He still has that riveting gravelly voice and presence at 91 years of age. And, yes, some of the script threads are loaded with clichés, but beauty, and clichés, have always been in the eye of the beholder. Director/writer Lee’s “BlacKkKlansman” movie validates his film’s relevance when he incorporates actual news footage from the recent “Charlottesville” incidents. Spike Lee is a determined filmmaker who like Sisyphus, continues to roll that racially-tinged stone up that mythical hill in Hades. He’s a bit akin to a terrier with a bone who won’t let go and we’re all the better for his tenacity.